“The bow shall be seen in the cloud: and I will remember My covenant … and the waters shall no more become a flood to destroy all flesh” (Gen 9:14,15). The rainbow is a sign that all the past sins are forgiven and forgotten by God. When you have genuinely repented for your failings and sins you must enter into a covenant with God – you can be very sure God has forgiven you and cast all the sins you have confessed behind His back. 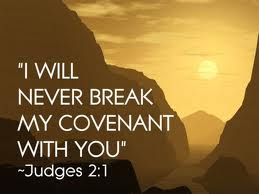 If you do not make a covenant with God, you will be confronted with the same failures no sooner than you repent. Many repent for their sins but they do not believe that the Lord has forgiven them and that victory is ahead of them, and therefore they do not enter into a covenant with the Lord. Today the Lord is speaking to you. Enter into a fresh covenant with God. Don’t allow the devil to keep bringing before you all your past failures and mistakes. It is very sure that you are going to have the victory. Keep your covenant with God before you and go from victory to victory. The rainbow is seen as an arch. If you are under this arch, under the covenant, that very covenant or arch will cover you and protect you from all the wiles of Satan. So dear child of God, remember, when we break our covenant with God, we are unprotected and exposed to all the assaults of the devil.